If there’s a lesson to be learned from The Mountain Between Us – which is sadly not the Rockies-set spin-off to The Space Between Us from earlier this year – it’s that if you are to survive a plane crash in the middle of the isolated snowy wilderness, you just need to make sure that you are either Idris Elba or Kate Winslet, and that’s really all you need to get by. Seriously, Elba and Winslet – who in the film play neurosurgeon Ben and photojournalist Alex respectively, strangers at an airport who board a charter plane together, only for the pilot (Beau Bridges) to suffer a stroke during mid-flight causing it to crash, and stranding them in the middle of nowhere – quite possibly experience the least dangerous survival story ever, and it’s amazing that both of them are not only still alive but come out of the crash with just bruises and a broken foot at the worst. But again, it’s okay because they are two very good actors who despite surviving a pretty horrific plane crash – shot in a single take to add to the immediacy of the situation – still look as amazing as they were before they even flew off, and continue to look like the best groomed survivalists you will ever see in a major film like this. Yeah, the whole thing is pretty silly and far-fetched, but it does at the very least make for a serviceable, if bland, romance – at least, when it turns into that just after the halfway mark. Until then, it’s a pretty generic survival story, one that feels like a much lamer version of The Revenant (which makes it slightly disappointing that at no point does anyone cut open a dead horse and sleep inside it just to survive) and somehow feels just as long in parts, especially when it becomes so predictable it never feels exciting because you know just what is going to happen. Again, it comes down to the actors – who once more play the best-looking survivors of a plane crash ever – who are as watchable as ever in their parts, even when they’re saddled with material that has them do some fairly unengaging stuff most of the time, but they make it work because they really are that talented as performers. The romance element of the story is where the film kind of drags the most, and while it’s not bad it definitely comes almost out of nowhere that these two would eventually fall for each other, even during the much more important activity of staying alive in the middle of this freezing climate. It takes centre stage during the third act of the movie, which is when all the romance movie clichés you could think of come together to make a fascinatingly lame conflict, and a just as corny resolution (although it ends with a sharp cut to black right at a pivotal moment that makes the moment unintentionally funnier when you think about what happens the millisecond that black screen comes up). It also goes on for way too long, and honestly given the focus on the actual survival element it feels entirely unnecessary, like an extended epilogue that is so desperate to tie up every loose plot thread even if the audience doesn’t care one way or another. In the end, it feels like this giant adventure where nothing was really accomplished in these people’s lives aside from the fairly obvious, and it never goes deep enough into the characters to make us really root for them to end up together. However, if what you want is a pretty-looking survival flick with even prettier lead actors, kind of like an old-school Hollywood epic but done in a way that’s far lamer and blander than any of them combined, then you’ll probably like it just fine. For everyone else, there’s no reason to trek out to see this, unless you want to know what it’s like to be pretty even when surviving a plane crash in the mountains. 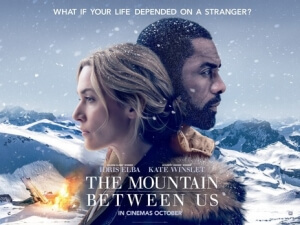 The Mountain Between Us is a lame and mostly generic survival story spliced with a clichéd romance story, strengthened only by the natural charm of both Idris Elba and Kate Winslet.